This is a small (37x22mm) board with an STM32L432KC6 MCU, 3.3V regulator, reset button, power LED, user GPIO LED, SWD header USB connector and all I/O pins brought out to SIP headers suitable for use in a solderless breadboard. With this board one can easily prototype small ARM Cortex Lxx applications with minimum effort and expense. This is not a full development system - you'll have to gather your own programming tools, power supply, I/O devices, etc. 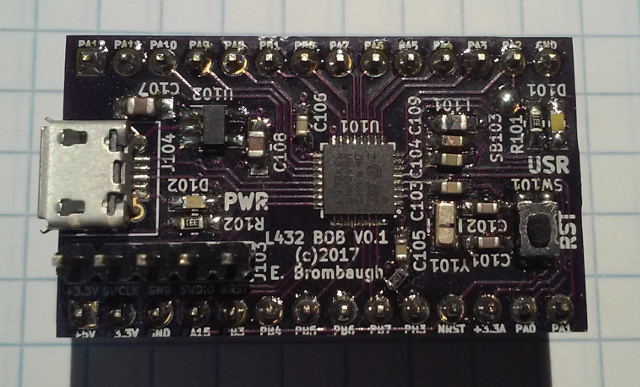 This is not an Arduino clone with all the low-level stuff already done for you. If you want to get by on the cheap you'll have to be familiar with setting up an ARM GCC toolchain as well as using a JTAG/SWD debugger. J101, J102: 28 pins of direct access to all of the pins of the MCU. In addition a 5V input and 3.3V output as well as 2 more GND pins are available. J103: 5-pin ST-Link V2 This connector provides the ST standard SWD debug/download connection. Note only pins 1-5 are used since this MCU doesn't provide the SWO normally present on pin 6. SB101/SB102: Optionally connect USB pins to SIP headers. D101: User GPIO - connected to PA2. Useful for diagnostics. D102: Power indicator - lights up when 3.3V is present. The STM32 family of parts are supported by a variety of commercial IDEs, all of which are available in low-cost or limited free versions from the ST website. Launchpad GCC: ARM-supported GCC (somewhat newer than the CS version above). OpenOCD: JTAG/SWD interface for programming a debugging. STM32F0 Discovery: Development board with USB flash programming and debugging. STM32 Standard Peripheral Library for STM32F0xx: Manufacturer's low-level C driver code. The STM32L432KC MCU is has excellent low power operating characteristics. 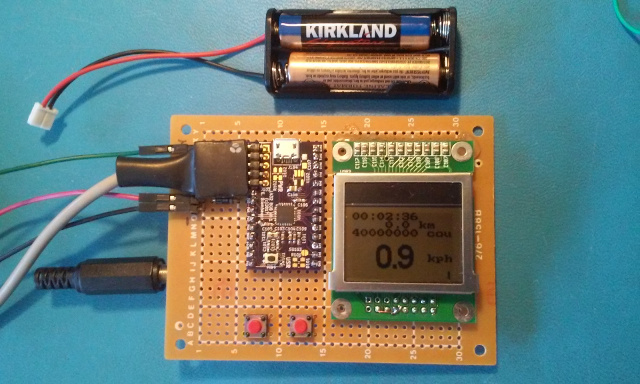 I've got a home-grown bicycle computer project that couples this board with a low-res monochrome bitmapped LCD for realtime display of time, speed and distance. During operation it draws less than 1ma and when powered down it pulls only a few nano-amps. V0.1 was first board fabbed. Note - this version is missing the 10k pulldown on the BOOT0 pin - you must bodge this on the board (see photo), or to external pin PH3. 10-05-17 - Schematic and layout started. 10-16-17 - PCB design sent to fab. 11-02-17 - Assembled. Basic blinky light and USB DFU work. 05-24-18 - Web page created.